After about two weeks of clearing out hops and barley in the beer making process, the filtering cloth is shipped overseas. 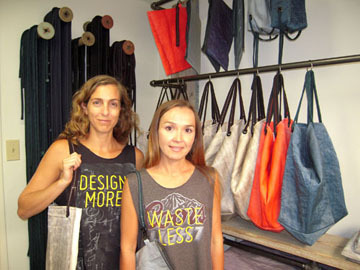 BEER-FILTER CLOTH is ideal for bags, says Jennifer Silbert and Lisa Siedlecki with some of their fall collection. Lately a funny thing is happening on the discarded material’s way to China. Designers Lisa Siedlecki and Jennifer Silbert are scooping up sheets of the beer-filtering cloth and making handcraft one-of-a-kind, limited-edition bags, totes, aprons and accessories. Amber-colored brew gives a coppery tone; darker brewski leaves a silver-grey shade, and the polypropylene fabric is lightweight and durable. “It’s perfect for a bag,” says Lisa. Their fall collection features eight styles in the beer patinas plus six colors, made of non-chemical dyes that give a distressed look. They purchase the fabric from large beer companies, who use something in the neighborhood of 100 tons of the filtering cloth a year, says Jennifer. Because the material is made of nylon and plastic, and can’t be separated in the U.S., it is shipped to China where recycling practices are questionable. On their industrial machines they sew stylish bag and tote handles from former climbing ropes collected from area gyms. French seams are made of thread that hails from a German factory with fair labor practices, and a company downtown manufactures their zippers. Lisa once designed leather bags for BCBG and traveled to large factories in Italy and Asia, all the while dreaming of a more socially and environmentally responsible way of life. “We wanted to build something that is not trend-driven but classic,” she said. “We are passionate about it, and it’s been amazing so far,” adds Jennifer, Mansfield Ave., an architect with a master’s degree from Yale and a background in researching and developing new materials. Their bags were gifted at a celebrity-studded event for Creative Coalition at the Emmy’s last month and will be targeted at boutiques, museums and online. For more information on how they repurpose materials and to purchase, visit rewilder.com. Bags start at $86.